Designed to be incorporated into customer's machines, these coolers have the lowest size and weight of any in the range. The simple design and low power fan motors gives a very competitive cost per unit of cooling. The extensive range is built up from a small number of standard stock parts. The standard aluminium radiators have a robust construction, type tested with 50,000 pulses of 13 bar (200psi). Each radiator is proof tested to 12 bar (185psi) and gives a long life at steady pressures up to 7 bar (100psi). For pulse pressures or steady pressures up to 20 bar (300psi). We offer steel radiators on certain sizes. (see also KG ranges for higher pressure ratings). Most fans are blowers with clockwise rotation viewed from the drive source. But the complete opposite is possible as a special. If vertical air discharge is required, the fan is commonly positioned under the radiator blowing upwards. The noise values on data sheets are given by the fan manufacturers in dBa and apply to free field conditions. In practice different conditions lead to sound reflection, reverberation and resonance, dependent on installation details. The resulting actual noise levels can be in excess of the nominal figure shown. The low power and current allows all single phase types to be driven from control circuit transformers, or normal wall points. Almost all sizes have three phase motor options with larger sizes also available with heavy duty aluminium radiators. All motors are rated high ambient temperatures, and operable on 50 or 60Hz supply, anywhere in the world. Most DC types have resin rotor motor construction with high resistance to vibration and very low sparking at the multi-fine brushes. Available with 12 or 24v motors. The larger sizes are also available with heavy duty aluminium radiators. 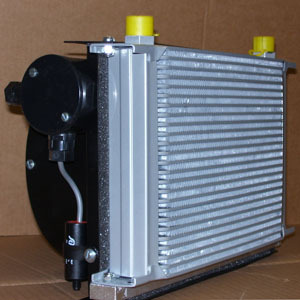 These coolers use simple, two part motors in aluminium or cast iron. The outlet flow must return to tank without restriction although special motors allowing pressured outlets can be fitted. Motor feed pressure/flow is often drawn from a main power line, so standard motor capacity is selected so as to minimise the loss of power.